Dmass at QO week 2 ; week 4 at Churchill, week 6 at RM, week 8 at home vs NorthLeast finish week 9 at WJ!! cougars get 5 home games !! 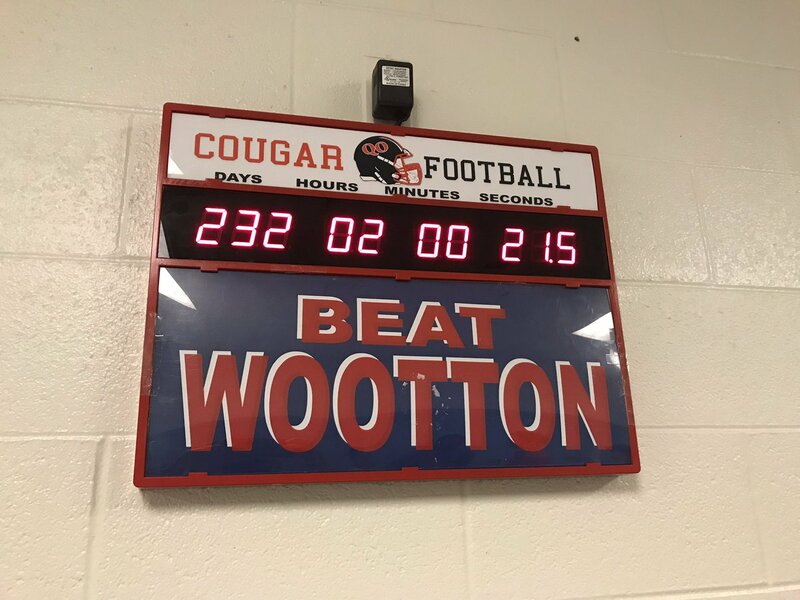 Guess they get Wootton week 1? I had a copy shared with me. Below is the weekly schedule. I listed the Friday date for the week, although some games may be moved to Saturday depending on facility availability, etc. All others should be self-explanatory. Predictably, there are not many great Week 1 games. Week 2 is a monster week! DA/QO, NW/PB, BK/SH, CH/RM, BL/WM. A ton of good games. Week 3 has some local rivalries (two DCC games and one NEC game) along with a rematch of the WM/BK game from Week 10's win or go home game. Week 4 has BL/PB, SH/Howard and features all four returning 4A West playoff teams playing each other - QO/CH and NW/RM. Week 5 does not have many great games, but a few local rivalries (BL/EI, WW/CH, BCC/WO) along with the old SV/DA rivalry. Week 6 again features the 4A West playoff teams, PB/BK and EI/WH consortia rivalries, and good rematches of WM/DA and BL/SH from 2018. Week 7 is highlighted by Broad Run/CH, a WO/RM battle and a measuring stick game for CL vs. NW. Week 8 has the QO/NW game, two DCC rivalries, the annual SH/PB tilt, DA/BK and the RM/RO rivalry. Week 9 predictably does not have many great matchups. Urbana at Clarksburg is big for other reasons. It will be both Plant's-Clarksburg and Wilson's-Urbana third season at their respected schools. It will be a 4A West game as Urbana has been placed for most sports in the 4A West. We should see Clarksburg take another step up and Urbana having what could be an awesome passing offense in the spread. This will be the Urbana's QB third year in this O. The question to me is will Urbana finally have a real tough D? I can see Clarksburg at 6-3 or 7-2. Not sure about Urbana but hopefully 5-4. Could these teams meet again in the playoffs #4 seed vs #5 seed? How so? Out of nine games, there are four vs. programs that are significantly better (PB/BL/SH/DA). There are five games against programs that are "winnable" in my opinion - MA/NO/KE/SP/EI. With the new playoff structure, Wheaton would likely make the playoffs by winning 3-4 of these winnable games. If Wheaton cannot win at least three against the five schools listed above, then it has no gripes about missing the playoffs. By virtue of being in the 4A North, Wheaton was going to play every MCPS school in that region (which included PB/BL/SH). If there is a gripe by Wheaton, it is just that the Knights have one more difficult game than their 4A North peers (NO/KE/SP). Wheaton was clearly judged similarly to Einstein, as both were given Damascus out of division while the other three were not given a tough out of division opponent. Blair (DA and WM), Paint Branch (NW and BK) and Sherwood (Howard and BK) were each given two reasonably difficult games out of division, and were clearly judged as being able to handle a more challenging schedule. You can make the argument that Wheaton belongs in the bottom group. But again, assuming Wheaton and Einstein are able to beat KE, NO and SP, they will likely make the playoffs. There are 12 teams in the new 4A North, and 8 will make the playoffs. 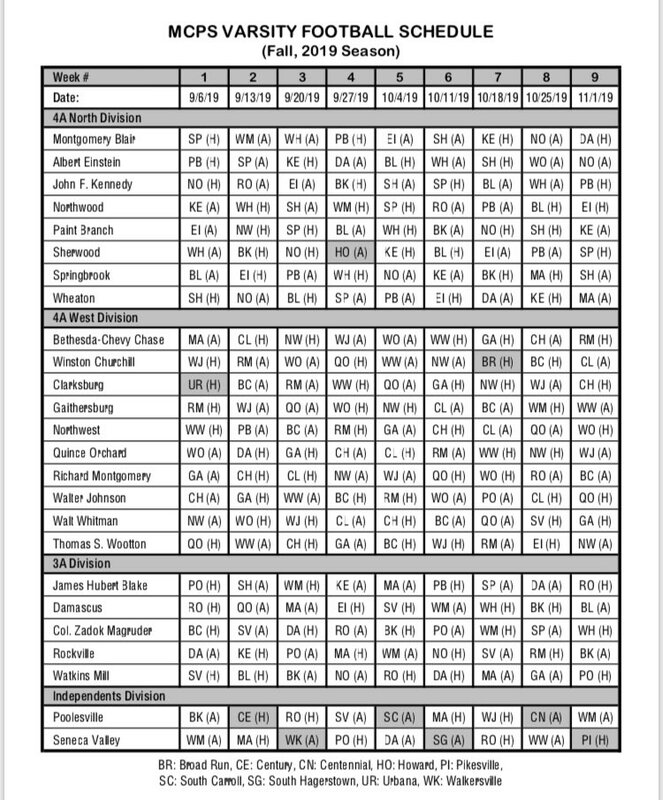 That means at minimum, one of WH/EI/KE/NO/SP will make the playoffs - and if a second one can outpoint one of the four Balt Co schools (Catonsville, Dulaney, Parkville, Perry Hall), then two will make the playoffs. As a point of reference - both Northwood and Springbrook finished above Catonsville (1-9) and just below a 2-8 Dulaney team in the points standings in 2018. Parkville was 3-7. Paint Branch 9-0. Biggest test NW Week 2.. We’ll get em 28-14.. Expecting 5-6 shut outs from the top 3 defenses in MoCo. 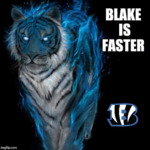 Returning one of the best LB cores. Will be a slug fest. I’ll have the best seats in the house live from the press box!